Custom Cables USA feedback | Discount Wireless LAN WiFi Antenna Extension RF Microwave Coax Cables Pigtails, Coaxial Connectors Adapters Tools...Lowest Prices! Have Your Say!- Take a poll! We make custom cables - Build Custom RF/Radio/Microwave/WiFi/WLAN Coaxial Cables/Pigtails Online - Easy to work with, and LOWEST market Prices! See what OTHER eBay customers SAY about us .. Sample products that we sell on eBay..
"Thank you for all your help and your thoughtfulness ... I like the open and supportive way that your company communicates and I will definitely keep you in mind for future business." "I received the cable yesterday and it connects perfectly to each connector I have and seems to be working great! Thanks for the fast shipping and helping me get the correct connectors for the cable! Have a great day! Josh"
"I just purchased one of your cables ... my neighbor wants to get one also ... "
"Quick shipping even over the Thanksgiving weekend. I would definately recommend." "Thank you once again for the prompt, immediate and courteous service. Thank you also for having the right goods at the right price. -Ken"
"Thank you for your time and your wonderfully informative website. Respectfully," R H.
"Fast shipping and works fine. Very reliable seller. Highly recommended!" "... I just decided to do nothing but your customer service is awesome. Thank You!" "You seem to be the only local place with reasonable prices ... "
"Thank you for the great customer service!" "Thanks for getting back to me quickly." Contact Us and we will try our best to help you get what you need At the Lowest Market Prices! when you provide to us a valuable feedback! We make Custom Cables / Pigtails for your special needs! SECOND: Scroll down the specific cable page, and Pick the Length you need. Shipping: We usually ship with expedited shipping methods (3-4 days) within 1 business day upon receiving cleared payment. View Shipping Policy. A FEMALE connector has threads on the outside and female center receptacle; (a Reverse type connector with threads outside and male pin is a "JACK"). Other LMR Cables or Special Orders - Contact Us Directly. Connectors or Adapters ONLY Order Here *All RG-58 series are LMR195 equivalent, and 400-series cables are LMR400 equivalent. Current available connectors are 3-piece-Crimp or Solder type only. Custom/Special orders can be placed by Contacting Us. Custom / Special Orders - Contact Us. Home | FAQ | Policy | Contact Us | Copyright © Custom Cables USA LLC. 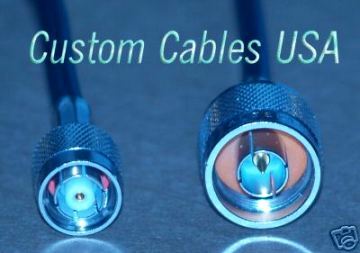 customcablesUSA.com, universalweb.com All rights reserved.